I have often thought that the things that occur whilst the songs are playing on my radio show would form an excellent basis for a late night, comedy sitcom. Those naughty words and inappropriate comments, combined with all manner of odd actions and manoeuvres, that could never be considered for the bits between the songs, would surely have great entertainment value to a wider, more understanding audience. 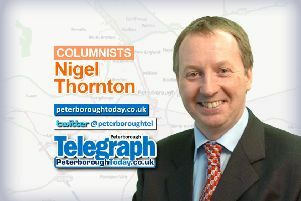 Just imagine, you would find out what we really think of the various councillors in Peterborough and what we put in their coffee, although you can probably already guess some of their nicknames. It could even be a fly on the wall documentary type show with a voiceover from one of the blokes who used to be in Taggart or perhaps one of the shouty gentlemen from Reggie and Bollie, now that they and we, have been put out of our X Factor misery. I can’t see them having too much on in the New Year, can you? Last week’s TV version of my BIG Conversation Show would have featured an interview with a rather portly fellow in a bright red jumper - No not Santa, it was the former leader of Peterborough City Council, Marco Cereste, without his trademark, black leather jacket. You see these are the details you miss when you just hear it on the radio. parkgate,” which he sort of did. Then whilst a record was playing, we embraced, enjoyed a quick game of paper, scissors, stone and had a chat about how lovely the Cathedral Square Christmas tree was and how much better it would have been if he had been in charge (I may have made up that last bit). Of course there are times when I have to double check that I am not already being filmed and that Jeremy Beadle isn’t about to leap out of the news studio, dressed as a policeman, sporting a very dodgy beard. In the last few years I have interviewed owls, kissed very ugly dogs (Mugly, of the Chinese crested, wet nosed variety) and had my legs waxed live on air. This would all have made for good late night, TV but sadly none of it was ever captured on film. But a debate on free speech had me searching every corner of the studio once again this week for hidden cameras – Certain that I had been the victim of some sort of ingenious wind-up. Surely this is an hilarious spoof I thought - A debate on free speech which ends up with my name plastered all over the newspapers, for something that I have said in jest – You couldn’t make it up and they weren’t! Honestly, this sitcom writes itself. Now all I need is a name for it - Pottyborough FM has a certain ring to it don’t you think?